Breaking with a long tradition of building my own desktops, I recently took the plunge and decided to switch to a mobile setup: an Alienware 13 R3 and Graphics Amplifier. Today is all about the 13 R3, and I'll go over the plusses and minuses of the Graphics Amplifier in follow-up post. 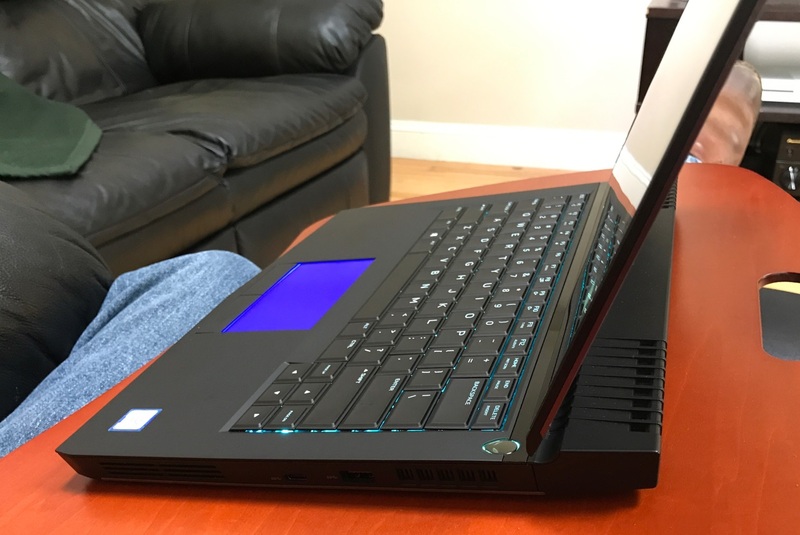 Up until fairly recently, buying a "gaming laptop" meant making a compromise -- you could have something that was portable and underpowered or heavy and powerful. The 13 R3 is the first laptop I've used that breaks this trend, thanks to some recent chip manufacturing improvements. These include a GPU die shrink from 28nm to 16nm from NVIDIA and (because it took so long to migrate to a smaller manufacturing process) a focus on power efficiency from both NVIDIA and Intel. The reason all of this fits in to such a small chassis? The hump! This is actually a fairly clever bit of engineering -- I cracked open the machine to look around and Alienware has used the extra space created by moving the display hinge forward for fans, heatsinks, and the rear port cluster. You never notice the hump when you're using the machine because you can't see it! The build quality is fantastic. The top and bottom panels are solid metal, and wherever plastic is used, it's thick and of high quality. One thing I like about the 13 R3 is just how dense it feels. It's a small laptop (13.5 inches), but it weighs 5.4 pounds! As I mentioned earlier, the port selection is hard to beat. It's especially nice having all of the video-related ports on the back of the notebook. Thermal paste is funny. It's not incredible at transferring heat, but it's a heck of a lot better than air. The problem is that the surfaces of the CPU/GPU and the heatsink aren't perfectly smooth. Viewed under a microscope, you'd see little pits all over both surfaces. The job of the thermal paste is to fill in all of those pits and help mate the two surfaces together, which means better heat transfer. The thing is, you don't need a lot of it! Too much thermal paste is just as bad as not using any at all. 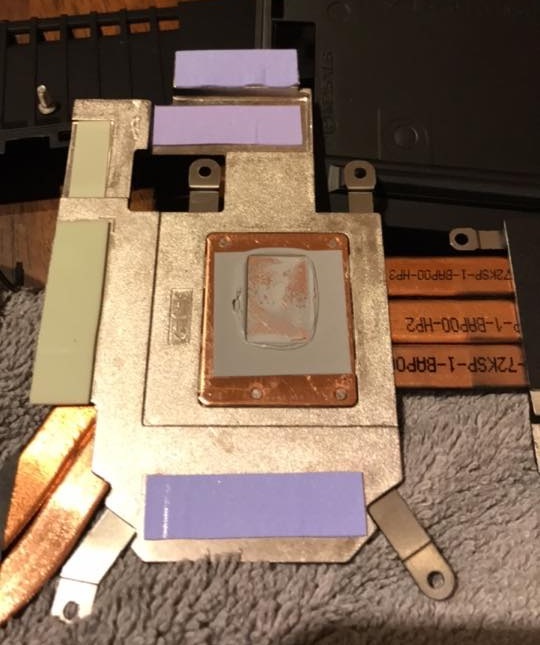 Given that the fans in the machine were coming on when I was idling on the Windows desktop, I figured it would be a good time to replace the paste and the thermal pads (those colored rectangular bits). It's not a difficult process, you just need some time, new paste/pads, and a copy of the Alienware 13 R3 service manual. I used Thermal Grizzly Kryonaut paste, one of the better non-conductive thermal pastes out there, and Fujipoly Ultra Extreme thermal pads (in 1.0mm and 0.5mm sizes). Now, under maximum load with Prime95, the temperatures on the CPU don't go above 75°C (167°F). I opted for the OLED panel, something I haven't seen in a laptop yet. So far, OLED has only shown up in high-end televisions like the LG E6. It's unique because, unlike LCDs, there's no backlight or filter -- the material an OLED display is made of glows when electricity is applied to it. Since no light is emitted when there's no current, OLED displays can show super-deep blacks. They're also quick -- it's much faster to apply and cut current to part of an OLED display than it is to twist and untwist the liquid crystals in an LCD. It's hard to show how good the panel looks with a photograph, but the best comparison I can give is from Jeff Atwood of Coding Horror -- check out his article on external GPU docks and find the comparison photo between the OLED TV and the LCD TVs. I guarantee that you'll be able to pick out the OLED one with just a glance. 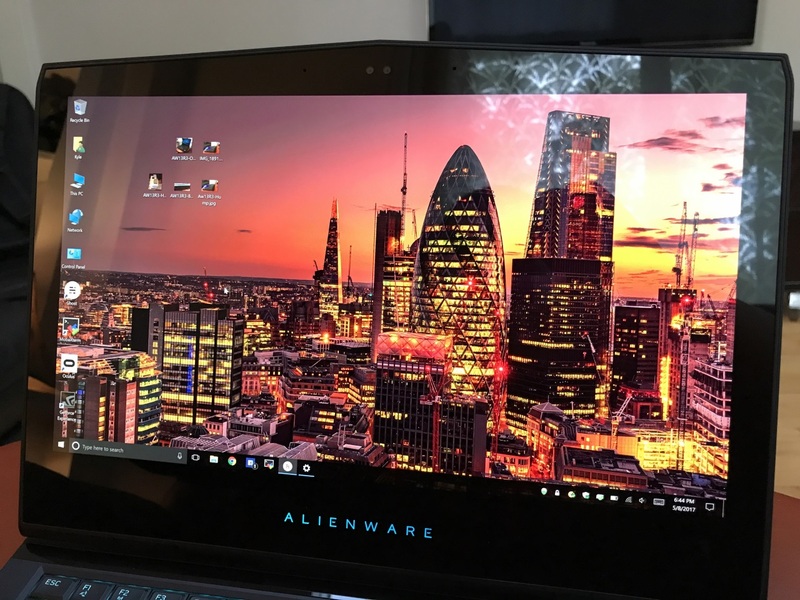 In a blessed change from what many PC manufacturers and Apple are doing with their keyboards, the Alienware 13 R3's is not an island-style board. While not as nice as my favorite laptop keyboards, the ones on Lenovo's ThinkPad T and X series notebooks, the 13 R3's is pretty good! The keys are full-size (18mm x 18mm). Key travel is good too at 2.2mm, and if you've had the displeasure of typing on a 2015 MacBook (the super-thin model) with its butterfly keyboard, the 13 R3's keys feel like pillows. If you've had laptops with keyboards that sag when you push on them, you're in luck here; there's no flex at all, courtesy of a new steel backplate. The backlighting is nice for typing in dim light, and while there's no per-key backlighting, the board is split up in to four zones that you can adjust independently. The touchpad inherits the keyboard's colorful backlighting. It's a Synaptics-brand pad, and unfortunately not compatible with Microsoft's Precision Trackpad standard. This is a shame, because Windows 10 supports some really useful gestures with Precision Trackpads. One thing to note: turn trackpad delay off under Mouse & Trackpad in Windows 10's settings or you'll run in to all sorts of issues with your external mouse playing games like Overwatch or Battlefield 1. All in all, this is a great little notebook. Next time, I'll go over the external Graphics Amplifier and let you know if it's worth picking up!